The Yangtze River cruise offers 3 memorable highlights: Three Gorges, Shore Excursions, and Three Gorges Dam. I discuss them on pages 2 and 3. Timing makes a big difference. It runs between Chongqing and Yichang. The length is 660 kilometers (410 miles) - about 10% of the Yangtze River's length. A downstream Chongqing to Yichang voyage (4 days, 3 nights) costs a little more than its upstream equivalent, but it saves you a day of travel. 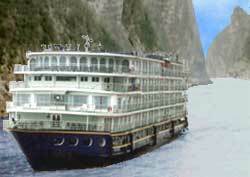 You have a choice of several dozen Yangtze River cruise ships. Some are first rate, some are middling, some are cramped "rust buckets". Generally, you get what you pay for.